Materials may be studied using a number of advanced X-ray Fluorescence techniques made possible using intense sources of monochromatic radiation, such as are available from electron storage rings known as Synchrotrons. Information such as elemental and chemical composition and speciation of chemical bonds may be determined at micrometer and even nanometer scales using modern synchrotrons and techniques employing X-Ray Absorption Spectroscopy (XAS) methods. Samples may also be analysed using charged particle beams, typically protons or alpha particles. Again this is a specialised technique (PIXE – Particle Induced X-Ray Excitation) and offers highly localised surface analysis with high sensitivity to low level trace elements. 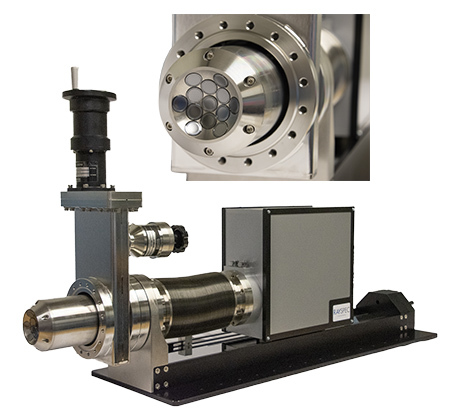 As an independent specialist x-ray detector company, RaySpec offers custom designed Silicon Drift Detectors (SDD) to meet the demanding requirements of synchrotron or particle accelerator beamline applications as well as other specific research systems. RaySpec Beam-line SDD detectors are available in single or multi-sensor configurations with sensors active areas from 10 to 170mm². In each case we take special care to incorporate an optimised choice of materials, geometrical design, collimation and sensor performance.